If you ask me what my favorite scent is, I will immediately answer “cinnamon”. Sweet, sweet cinnamon. I just get so in love whenever the aroma fills up the room! There are two particular things I most like to use cinnamon in; one is in my veggie chips and the other is in my breakfast bowls. Obviously, as the title of this post suggests, we're making the latter one today! Not lying -- this cereal bowl has got to be one of the best I've ever made. Like all my recipes, it's made with wholesome ingredients like fresh fruits and homemade granola. They make such incredible chunky, chewy, soft and moist textures and combine wonderful sweet flavors! And the scent? Oh, it’s just heavenly! So lovely and nutty and citric – I will run out of flowery adjectives describing it! In a nutshell, this cereal is a party for the senses so make sure you're armored for a mind-blowing breakfast experience when you wake up to this. Enjoy! Because you totally will. 1.) 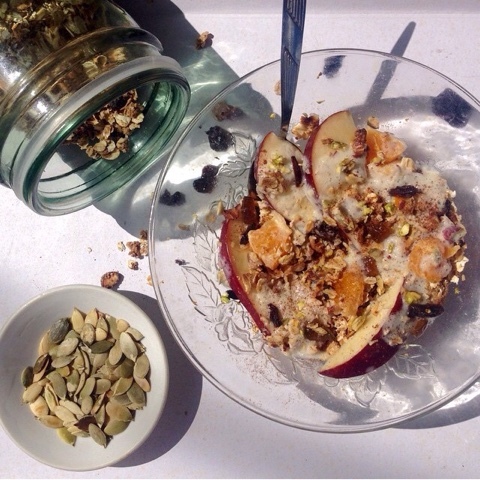 Combine all the dry ingredients and fruits in your breakfast bowl. 2.) Mix the wet ingredients in a separate bowl and then pour over the cereal.